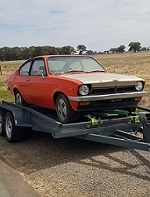 Build thread- viewtopic.php?t=48434 - TC Coupe Project - LH Torana - D22 Navara. Not sure how the left vent even attaches, mine was silicone'd on, so I drilled & glued in some socket head cap screws, and repaired some broken bits on both left hand vent & drivers side fuel cover flap. The fun bit with this mod is getting all 4 nuts and washers on. Can be done. Everything lined up, high filled, guide coated, and ready to block!!! hopefully it wont need another primer hit and I can get this thing into a booth to put some paint on!!! get it painted! Looking forward to cruising with this at nats. PS mind telling me about the mod to fit the vent a bit? So all I did was drill some holes in the passenger side flap- a little bit deeper,where the snapped off lugs were meant to go, and glued in some stainless M5 Socket head cap screws (allen key bolts) then had to drill the holes in the body out just a little bit. once the car all goes together, it will get nuts put on behind. Not 100% but should be accessible from both boot behind wheel arch, & rear coupe trim access area in front of wheel arch. An old bloke I know told me they used to prank their mates and pretend to open the fuel door but rip the passenger side off as a joke. I've got a NOS one I found but I don't want to use it in slim to none chance it ever gets rotisseried and restored. I might have a play with the busted one I've got and see if I can get it to fit and see how I go about locking it off. Aaaaaaaaaaaaaaaaand . . . . . The blocking begins / Continues. By the way, i'm not a penal beater, so this is going to take ages. A penal beater would make you a prostitute wouldnt it?